Cross measures 1 1/4" tall by over 3/4" across (with hoop/bail measures approx. 1 5/8" tall). Beautiful design and quality, depicting the Lord's sacrifice on the cross. Approx. 3.4 grams of Guaranteed 14k solid gold. 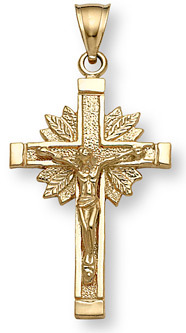 We guarantee our 14K Yellow Gold Crucifix Pendant to be high quality, authentic jewelry, as described above.